This year, my husband fanned a flame in my son that will surely become a lifelong obsession. He got him interested in motorcycles, so for our son’s 4th birthday, we had to (had to!) have a motorcycle theme. It was really quite a bit of fun, from a fun photoshoot at Space Coast Harley Davidson for some really fabulous pictures to rolling a full-sized motorcycle into the living room for photo ops. Thanks to Rockets and Rainbows for the awesome embroidered birthday shirt seen above, which my son now obsessively wears. Tomato cans of all sizes became oil cans in our motorcycle shop, and those motorcycles propped up on top? Cookies. Professional cookie makers are so talented, and there’s some fabulous fondant work on top of chocolate peanut butter cupcakes by Love and Sugar Kisses. French macarons with little flames! So genius. Of course, I can’t make those either, so earthandsugar was nice enough to provide this unique spin on the macaron. Bonus points that she’s an organic baker! I am good at baking cakes—they taste fabulous—the decorating part I’m still working on! But this chocolate ganache butter crunch cake was a total hit; the guests were fighting for crumbs by the end of the party. Sometimes tasty trumps over-the-top presentation. Our little biker dudes left with a bevy of favors—T-shirts from Stirling Promotions (great customer service!) in a jar that read “Born to be Wild,” cool sunglasses, skull peppered bandanas and a CD of the party playlist went home with everyone. The motorcycle was a huge hit with parents and kids alike. Lots of photos were taken onboard! The full shoot can be seen in Festivities Magazine’s Summer 2013 issue. This is definitely a change from “Puff the Magic Dragon” last year. He’s getting so big! Amazing party Paula. Hardly seems like a year has gone by already! I couldn’t slip another fairytale by him this year, but this ended up a lot of fun anyway. And thanks! This is so cool! I absolutely love all the details and all the “wildness” you put into them. 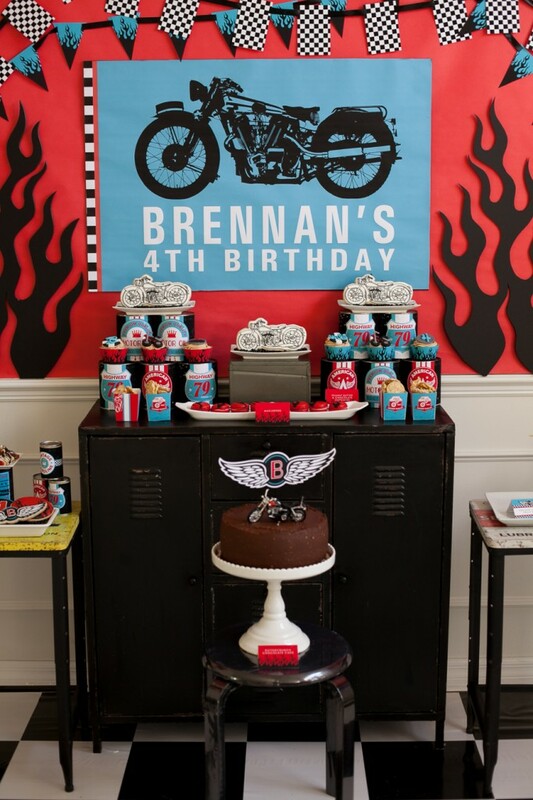 I’m now considering a motorcycle theme for my son’s birthday this year… but I don’t want to give him any ideas. I wouldn’t want him developing an interest on motorbikes or I’d be a nervous wreck! Absolutely one of the coolest party themes ever!!! It’s okay. They’re just little. For sure that won’t mean he’d grow up to be a mean biker! Pingback: “Born 2 Be Wild” – The Loot | Yay Baby! Pingback: “Born 2 Be Wild” The Birthday Girl & More Cuteness | Yay Baby!